Those that wish to live in caves will quickly learn one thing: Light is everything. Moltara never saw so much as a speck of sunlight. Any Neopet that valued their life knew well to always take a light source with them when traveling through the massive maze of tunnels and caves. If their light was lost, the Neopets that can't see well in the dark would soon find themselves at a vast disadvantage to the creatures that can. To the average Moltaran, light meant staying alive. But to the Fireflies, light was their life. Nestled away in an isolated cave in a far corner of Moltara was the aptly-named City of Lights. Lamps and lanterns of all shapes, sizes, and colors adorned the walls of the cave. By far the brightest place in all of Moltara, one would not be criticized for wondering if darkness even existed in the city. But while the artificial lights made it the envy of the other tribes and cities, it was the citizens themselves that earned the city its name. Everyone in that city was a Glowing Buzz. 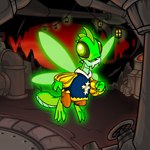 They were the Fireflies, proud of their identity as Neopets that naturally adapted to their dark environment. With such deep-rooted pride, none them would ever think of being anything else. The City of Lights was built exclusively for Buzzes, and it showed. Rows of houses and stores were carved into the cave walls, leaving a large, open circle in the middle of the city to allow for plenty of room for flight. It was practically impossible for a flightless Neopet to traverse the city; there was not a single staircase anywhere in it. In the very back of the cavern, the largest building in the city stood. It was nearly three stories high, almost touching the ceiling. Like all the other buildings, it was decorated with multicolored lights. But this one had many more lights illuminating its curved walls. From afar, it appeared as a mass of glittering gems. It instantly stood out to any traveler, and for good reason. It was the palace, the King's home. The palace had many lavish rooms, but the King's favorite area was the balcony on the third floor. From there, he could take even just a small part of his day to relax and look over the city from above. He would gaze at the distant lights and lanterns and watch the rest of the Fireflies go about their daily lives. At that distance, making out their individual features was impossible. But the way they appeared as small, graceful lights smoothly dancing around in the open space was something that the King would never get tired of seeing. That day, he walked out onto the balcony and rested his arms on the rails. The sparkling lights fluttering around that he had grown to love were nowhere to be seen. Every now and then, a few Fireflies would make their appearance, but would quickly disappear back into their homes. Even with all the artificial lights that the city was known for, it looked so dark without the glow of the populace filling the city circle. Lumin gave a sigh as he stood there, watching and waiting, almost hoping that at any moment the city would brighten back up. The King, small in size and lacking in muscle and strength, had often been told throughout the years that he had an almost melancholy demeanor. It was never his intention to give off that kind of aura, but the way Lumin's eyes were often half-closed, his expression either being neutral or worn with a frown, and his overall quiet disposition still gave that impression to others. He watched the city for a minute or two. He held his hand to his forehead, running his claws through his long, somewhat spiky, light-green hair. Lumin turned around and headed back inside after seeing yet another reminder of how grim the situation was. Their water supply came from an underground lake. Since these sorts of lakes were hard to come by and competition for them was fierce, that particular one was the only access they had to water for a long time. For many decades, it served them well without any problems. But since Moltara was a volcanic region, toxic chemicals accompanying its eruptions was standard fare. At some point, said chemicals made its way into their water supply. At first, a few people became ill from the water poisoning, including Lumin himself. The poison wasn't unknown to them. It had stricken the Fireflies many decades in the past and they had a supply of the antidote on hand. But after a while, it became apparent that the contamination was much, much more serious than they had initially thought. More and more Fireflies became sick, and the supply of the antidote ran out. Search teams were sent out to find the plant needed to make more growing on the surface, a place where most Moltarans those days rarely ventured. But none could be found, all while more Fireflies grew ill. They had since found another underground lake that was both unoccupied and uncontaminated, but that still didn't change the fact that much of the kingdom was sick. The activities in the city ground to a halt, since most Fireflies were either sick or taking care of those that were. Lumin walked through the halls and floated down the openings in the floors leading to the lower levels until he reached the largest room in the palace. The throne room was in the middle of the building on the first floor. The walls depicted art not only of their earliest ancestors that settled in the area, but also of each ruling monarch in the past. It was made so that whoever ruled in the future would never forget who led before them. The room was large and wide, allowing plenty of space for even large groups of citizens that had issues to have their voices heard. At the end of the room was where the thrones of the King and Queen were. Usually, those two thrones, white and ornate, sat on a platform a few feet above the rest of the room. But ever since about a month ago, there was only one throne. Lumin stared at the single throne for a while. It didn't take long before he could feel tears start to form in his eyes, with the emotions and memories still so fresh in his mind. He remembered watching the Queen's condition worsen with each passing day and there not being anything he could do to help her. He remembered the doctors knocking on his bedroom door while he was asleep and falling to his knees when they gave him the news. Lumin shut his eyes, shakily lifted his hand to cover them, and took deeps breathes in an attempt to keep himself together. He heard the sound of footsteps, more accurately that of boots made of metal walking against the stone floor. There were many guards and soldiers in the Firefly army, but only a very few had the distinction of being a Royal Guard. They were the most elite warriors in the City of Lights, and their duty was not just to protect the royal family, but also to command and lead their subordinate soldiers. It wasn't a title that was given out to just anyone, which made the four Fireflies that did have it at that time even more esteemed. The Royal Guard making his way down the hall and in Lumin's direction was a middle-aged Buzz named Infrared. Save for his head and wings, his entire body was covered in bronze armor that was surprisingly light-weight. While Infrared was a very large Buzz in his own right, standing next to the rather small Lumin only accentuated that. He had a sturdy and muscular build and towered over most other Fireflies. His hair was black and cut very short while his beard covered most of his lower jaw. Infrared was the oldest and most experienced Royal Guard at that time. Serving in the Royal Guard seemed to run in the family for him. Up until they retired about a decade ago, he served simultaneously with his parents. His twin sister, Ultraviolet, was also a Royal Guard that joined not too long after he did. Ultraviolet was also the Queen and the leader of the Royal Guards. Needless to say, when the poison had claimed her, Infrared took it just as hard as Lumin did. As he stood with him, also looking at the lonely throne with the same sorrow in his eyes, he didn't say anything. Infrared was usually the type to speak his mind. But over the subject of his sister, he was at a complete loss of words. Not long after Infrared had arrived, Lumin heard the sounds of another Royal Guard. He couldn't make out exactly what was being said, but he was able to recognize it as a small group of lower ranked guards being dismissed. As the Royal Guard giving the dismissal came closer, the sound of chain links hooked to her belt hitting against one another could be heard. It was an odd choice for a weapon, but it was one that she was able to wield efficiently. Out of the four Royal Guards, Lampyri was the second youngest and the only female left after Ultraviolet passed away. She was barely taller than Lumin, but her small size wasn't a hindrance in battle at all. Like many other Fireflies, she possessed black hair, parted down the middle and long enough that she kept it braided. Lampyri always seemed to give off a confident demeanor. Her expressions told others that she would be able to complete any order or mission given to her and that she held no doubts over her abilities to do so. But the poisoning sweeping the kingdom had caused changes in the attitudes of everyone, whether they were ill or not. In Lampyri's case, she held her head down ashamedly as she walked, not giving eye contact to Lumin as she approached him. "No luck?" Infrared asked quietly as Lampyri came closer. "Nothing," she replied, her voice laced with bitterness. "Absolutely nothing." Not long ago, Lumin had ordered Lampyri to lead a search team and comb the island above for the antidote again. It wasn't the first expedition Lumin had sent Fireflies on, and by Lampyri's reaction to Infrared's question, it wasn't going to be the last. There was a small tunnel within the City of Lights leading to the surface, so making expeditions there wasn't unfeasible. But all Moltarans –not just the Fireflies- hated to leave their underground homes to go to the surface, even for short periods of time. Knowledge over the dangers and hazards that the jungle growing above them possessed long since faded over the generations. To those living in the present, the surface was akin to an entirely different world, one to be feared and avoided. For the Fireflies to make regular trips there without hesitation was a certain sign of desperation. Lampyri continued to walk past Lumin and Infrared until she entered a room a few doors down the hall. She made it a point to go there several times a day when she wasn't out hunting for the cure. It was a place that Lumin also had business to attend to, and decided to follow her. Lumin opened the door, making sure he was as quiet as possible walking in. It was the infirmary, where he was met with the sight of many of his soldiers and servants bedridden with the poison. All of the doctors that worked in the palace were there, treating the symptoms as best as they could. But without any antidote, said symptoms would reappear without getting weaker in the slightest. Lumin found Lampyri pulling up a chair next to one of the beds. He went where she was and stood over the ill Buzz there. The patient was another Royal Guard, young, of moderate height, and usually fit and in good health. But he was evidence that even the strongest in the kingdom were not immune to the poison. It had weakened him severely; it took him a large amount of effort to make any kind of movement greater than readjusting his position. His skin was pale and his glow was very faint. His wavy, dark-green hair that was normally kept neat had grown unruly from neglect. He was asleep when Lumin and Lampyri had entered the room. After a few minutes, he began to wake up, but it took him a while to notice Lampyri sitting next to him. "Glowstick?" Lampyri whispered, loud enough for him to hear but quiet enough not to disturb the other patients. "How are you feeling?" Glowstick spent the next few seconds staring up at the ceiling, his eyes dull and glazed over. When he finally spoke, he sounded weak and hoarse. "Nauseous." The three Buzzes were in silence for a while, with Lumin and Lampyri watching over the barely-conscious Glowstick. At first, he was for the most part quiet. But after a while, he had begun to appear restless. He still couldn't move much, but his eyes clamped shut and his breathing became heavy and ragged. "It's too loud in here... It's too loud... Make everyone stop talking so loudly..."
Lampyri looked away slightly, still refusing eye contact with anyone. "The room's quiet. There's no one talking, Glowstick..." she told him, her voice as she struggled to keep herself composed. "Yes, they are!" Glowstick snapped, suddenly raising his voice. His claws began to dig into his scalp as he covered his ear holes. "It's giving me a headache... Shut them up! Shut them up!" At that point, his entire body began to shake slightly before outright convulsing. His distressful shouts filled the room and echoed in the previously somber and quiet atmosphere. A wave of pain came across Lampyri's face. Not physical pain, but the pain that came from watching somebody close to her go through what Glowstick was experiencing. Lampyri and Glowstick were best friends. They had befriended each other while training to be Royal Guards and had known each other for a very long time. They had often partnered up in battle and looked out for one another. When those two were fighting together, they were able to keep each other from being harmed. But now her friend was fighting a losing battle while she was completely helpless to ease his pain. It was a distressing reminder that even as strong as the Royal Guards were, they were losing a battle against something that they couldn't even see. One of the doctors working there ran over when he heard Glowstick's screams. He got Glowstick to sit up and take some medicine, despite his protests. It was a while before the medicine took effect, but when it did he became silent and still before falling asleep again. While Lampyri opted to stay at Glowstick's side for a little longer, Lumin decided to look for the head doctor before he left. When he found him, he requested to speak with him and pulled him aside. Lumin was usually a soft speaker to begin with, but he was still careful to keep the volume of his voice down as he asked, "How many more people can you fit in this room?" The doctor took a moment to look around at the patients that were already there before answering, "Probably fifty at the most." "The city hospital is overcrowded with patients and the doctors there are finding it difficult to treat them in such a high concentration. I want you to give the OK to the other doctors and start to move patients here for treatment. If this room still isn't enough, we have plenty more in the palace that we can empty out. I don't want anyone to have to be treated out in the open because there's no room inside." While the doctor spread the word, Lumin began to leave the infirmary. Lampyri sat in place, the frustration steadily building up in her. But even amongst all her anger, there was a sense of determination in her face that she refused to let go of. Even from a distance, Lumin could hear Lampyri declare her resolve under her breath, "I will find it... No matter how many times I have to go back up there, I will find the cure!" Even if Lampyri carried undying optimism with her, the same couldn't be said for Lumin. He was just about to turn in for the day when the thoughts of his people fighting against the poison and their families doing all they can to support them began to race through his head. The sight of the city darkening from the lack of healthy Fireflies and the damage that the poison was causing to the city replayed in his mind over and over. He saw the faces of those close to his heart, the ones that succumbed to the poison and the ones still struggling. He stopped in his tracks at an intersection between two paths. He stared down the part of the hall that led to his room. Lumin felt his heart pounding just from thinking about the situation. There was no way he would be able to fall asleep as anxious as he was. If he was going to get any rest, he needed to relax himself and calm his mind first. He knew what he could do to achieve that, and decided to instead go down the other hallway before going to bed. Every ruler possessed treasure. There was a myriad of different things that a monarch's treasure could be. Many had gold and jewels while others had ancient artifacts whether from their own kingdom or from another that they conquered. Sometimes it took the form of monuments, other times it would be countless records of history. Whatever it was, it was always something that the monarch would want to keep safe and make sure that it is always well-guarded. The entrance to the room Lumin's treasure was in was marked by a large, heavy door with several locks in place. Lumin insisted that there always be guards on duty keeping watch and making sure that nobody other than a very select few of his servants and himself enters. The instant the guards opened the door and allowed Lumin to walk into the room, he was met with a blast of warm air. There were pipes along the walls flowing with hot water, maintained so that the temperature was always comfortably warm but never too high. The sound of the water running through echoed in the mostly vacant and empty room. There was very little in there, barely anything that had any kind of monetary value. But the treasure that Lumin kept guarded at all times was priceless. In the middle of the room was a small, light green egg. It was placed in a specialized cushion, soft and made to keep the egg from rolling away and breaking. Even though it had been a while since the last time Lumin had slept, his senses suddenly heightened in the presence of the egg. He became alert and awake as he approached it, even if just temporarily. Lumin carefully picked the egg up, taking every step he made very slowly. He gingerly made his way to a small chair sitting in the room, gently sitting down once he reached it. Buzz eggs only took about five months to hatch. The one Lumin held was three months old. It was made before the kingdom was afflicted with the poison. For that small amount of time, Lumin and Ultraviolet were able to look into the future with happiness. Much of their free time was spent just watching over the egg, discussing possible names, imagining what the child inside would be like, and awaiting the day it would hatch with eagerness. When Ultraviolet fell ill -in those few moments that the poison would allow her to be lucid in her thoughts- she told Lumin that she regretted not being able to see the child hatch and grow up. Lumin desperately begged her not to think like that and that she would be there for the child and that they will find the cure in time. When Lumin failed to keep his promise to her, his hopes and spirits were swiftly crushed. From that point on, his vision of the future became much bleaker. But in a way, just being with the egg prevented him from descending into total despair. Doing something as simple as holding it in his arms and gently stroking the shell with his hand was able to calm his restless thoughts. Despite the sorrow and fear that accumulated in him over the past month, feeling even the tiniest movements inside the egg was able to bring a smile to his face. "I won't let you be born into a dying kingdom. I promise," Lumin whispered softly. Even though pessimism and a lack of hope clawed at his thoughts, the egg Lumin cradled ignited resolve in him. He intended to cure the kingdom and end the strife running rampant through the hearts of the citizens, and he intended to raise his child in a healthy environment. Even though his failure to save Ultraviolet was still a clear memory, he became determined not to fail at keeping his word again. Feeling that his mind had been put at ease for the time being, Lumin stood up and carefully put the egg back in place. He knocked on the door, signaling the guards to let him out. Giving them a nod and a, "Thank you," Lumin left the nursery and walked to his bedroom. He opened his bedroom door, locking it behind him. Lumin went to his wardrobe that stood by the opposite wall. As he changed from his silken green tunic to his sleeping robes, his mind began to fill with anxious thoughts again. But he quickly pushed those notions away into the back of his head. For however long it took him to get rested up, he needed to keep himself at ease and not allow stress to steal sleep away from him. After that, then he would be able to direct his thoughts towards solving the kingdom's problems. Lumin spun around. The voice, sudden and unexpected, immediately made his heart jump and pound in his chest. He backed up into the wall and looked at the source of the voice that sat comfortably in one of the chairs. The young-adult Acara with red fur lounged in the chair, using the cushioned armrest to hold her head with her right paw. She had thick and smooth brown hair that wrapped around her large ears and horns. The Acara wore clothes that was the standard for many of the other Moltaran cities. As opposed to silk, she was dressed in a brown leather jacket and pants, decorated with many straps, buckles, and brass gears. As she calmly sat in place, the faint sound of her gently tapping her black boots against the floor could be heard. Lumin never heard the door open. Indeed, it was still locked. He didn't hear footsteps or anything that suggested that someone was approaching. The Acara was just suddenly... there. She literally appeared out of thin air, sitting lazily in his chair like there was nothing unusual about it. "Who are you?! How did you get in here?!" Lumin demanded, that moment being one of the few times that he had raised his voice. Unlike Lumin, the Acara wasn't so agitated. She didn't seem to be bothered by Lumin's shouts. Instead, her face remained very calm, her small smile peaceful and serene. Her aura was soothing, even able to settle Lumin's nerves a bit. "How I got here isn't important. As for who I am, I'm the solution to your problems," she replied calmly. Her voice was soft and able to ease Lumin's spirits even more. His posture became less stiff and on-guard as the Acara began to convince him that he didn't need to fear her. But he still looked at her warily, not moving from the spot he was in. He spoke again, this time at a lower volume, "Your name?" "It's whatever you want it to be," the Acara answered simply. Lumin's cautious looks turned into ones of confusion. He wasn't quite sure what to think of her odd reply and remained silent. After realizing that Lumin wasn't going to give a response, the Acara closed her eyes and sighed, "Very well then," After a moment, she opened her eyes back up. "Some like to call me 'The Engineer.'"